Creator of Project Me, helping mothers get on top of their endless to-do's, set goals and find a happier balance. 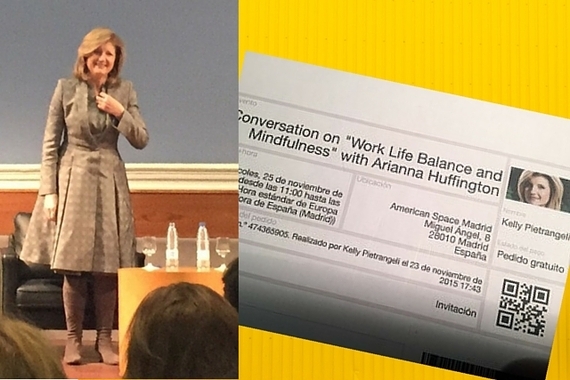 I recently had the pleasure of attending an inspirational talk in Madrid by Arianna Huffington, founder of The Huffington Post and author of the wonderful book 'Thrive'. They go to bed feeling exhausted and guilty for everything they haven't managed to get done. There's always going to be your to-do list. But you also need a gratitude list. Every single day, write at least three things you're feeling grateful for. The more gratitude you have for all of the people and things you have in your life, the more grace you'll extend yourself for not 'getting it all done'. Focus on what you achieved each night before bed, not on what you didn't manage to do. Of course, this made my heart sing, and if you've been following Project Me for any length of time you'll know that I'm always banging on about gratitude as a daily practice. There's even a place to write gratitude at the top of my Design My Day action sheet. Never leave that box blank to just focus on your to-dos. "Life is a dance between making it happen and letting it happen." We feel guilty as women because we find it hard to balance our needs with everyone else's, but we need to educate this inner voice. It's never going to be perfect. It's about learning to dance with it, moving from struggle to grace. Don't judge yourself if you're not doing what you're supposed to do. Take small steps toward your goals. Model a baby who is learning to walk. If babies reacted like adults when they fail, they would give up and never walk. But how many of us pay the same attention to our own energy levels? Do we notice when we're running on low? Do we stop and do something to recharge ourselves? Many of us are running on dangerously low levels and don't realise that there's not an infinite supply. We will burn out if we're not careful. It's important to pay attention to what your ideal number of hours of sleep are per night. For Arianna, it's eight and a half hours. For me, it's eight. If I get seven hours, I'm operating slightly substandard and I can feel it. Six hours, I'm fuzzy-headed, unfocused, lethargic and irritable. When I get less than six hours, the voice in my head goes negative towards myself and others. I completely lack motivation. I feel down and I take it out on those I love the most. If you've got a child who still wakes in the night, you have my sympathy. It wasn't until I began getting full nights of uninterrupted sleep that I began to feel human again. Many of the women in my on-line programmes are past the baby and toddler stage, yet they're getting to bed too late out of habit. They're depriving themselves of the deep benefits that come from getting enough sleep. Arianna's now so devoted to good sleep that her next book is dedicated to it. Thirty minutes before lights-out, set an alarm as your 'shutting down time'. No computers, phones or TV allowed. Create a before-bed routine to wind down. Have a bath, climb into bed with a good book. So busy women, take a lesson from Arianna and take care of yourself. Put your own oxygen mask on first. It's not selfish, it's essential if you're going to continue to give your best energy to your family. It's the key to being the best version of you. Are you up for a challenge? How about setting an evening alarm every weeknight for when you'll shut down all electronics and get ready for bed? In the comments below, tell me if you'll give it a try. Or share how many hours of sleep YOU need to feel 100% the next day. Kelly Pietrangeli helps mothers set goals and take charge of their own happiness. Her free Project Me Life Wheel Tool has helped thousands of women to find a happier balance between the kids - and everything else. Click here to give the Life Wheel Tool a spin for yourself.